A friend of mine is a writer, she helped me with my About section on this blog, well ok she did it, she wrote it. Because she is by far a much better writer than I, for god’s sake she is a published author. You can go here to find out more about her. Well this post is about the apple that doesn’t fall far from the tree. Jammie’s daughter Kaiten is following in her mother’s footsteps, in that she is a young budding author herself. She has written a story “The World In My Eye.” After hearing her story, from aunt Angel Adams, who is also a creative, this family is over flowing with IT! Back to the story, after hearing the story the ideas for an image to represent the story started flowing, then we heard of the idea she had and when the author is right she’s right. So when Kaiten with her mother and younger sister had stopped by I thought let’s do this. So I had them both come in and jump up on one of the tables to bring them closer to the light and with the help of her sister and aunt shaping the light with a reflector we captured the image, thanks guys for helping to make it happen. 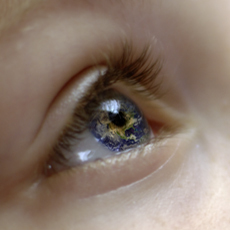 Here is the final image I ended up with including a detail of world in her eye. An image I came up with to represent the story written by Kaiten Kern. A detail image her eye with the World in her Eye. ← STOP!!! Take 5 minutes…!